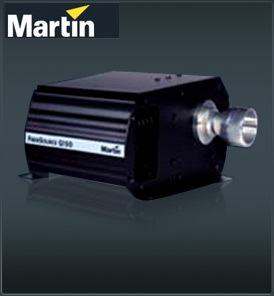 The Martin FiberSource Q150 is a dedicated light generator for fiber optic applications which can accept up to 300 flexible 1 mm fibers, either side or end emitting. A 6000 hour 150W lamp produces a bright white light source. • Accepts up to 300 flexible 1 mm fibers, either side or end emitting. • Colored light with the insertion of a standard 52 mm dichroic filter. • Compatible with all major fiber manufacturers. • 6000 hour 150W lamp included, produces a bright white light source. The basic white light source of the Martin FiberSource Q150 can easily produce a colored light with the insertion of a standard 52mm dichroic filter. The Q150 is compatible with all major fiber manufacturers. The Martin FiberSource Q150 is available in two versions, a normal version and a special low noise version which should only be used in controlled ambient temperature environments.